150 km from Jaipur and 170 km from Delhi, Alwar is nestled between a cluster of small hills of the Aravalli range. Perched on the most prominent of these hills is a massive ancient fort that whispers tales ofthe rich history of the city. Once an ancient Rajput state, formerly known as Mewat, Alwar was nearest to the imperial Delhi. The people of the state did not accept any external interferences and daringly resisted against foreign invasions. In the 12th and 13th centuries, they formed a group and raided Delhi. But finally Sultan Balkan (1267A.D -1287 A.D.) suppressed them, bringing the area under the Muslim rule. In 1771 A.D., Maharaja Pratap Singh, a Kachhwaha Rajput belonging to the clan of Jaipur's rulers, won back Alwar and founded a principality of his own. Apart from its long history, the city has a rich natural heritage with some beautiful lakes and picturesque valleys thickly wooded in parts. Some of the finest variety of birds and animals are spotted here. 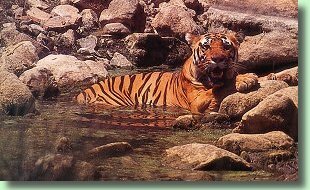 Alwarhas one of the finest wildlife sanctuaries in Rajasthan -Sariska, which is an excellent tiger country. The Fort : This huge fort with its ramparts stretching 5 km from north tosouth and 1.6 km from east to west, stands 304 metres above the city and 595 metresabove the sea level, constructed before the rise of the Mughal empire . Babar hadspent a night at this fort and took away the hidden treasures to gift to his son,Humayun. Akbar's son, Jahangirhad also stayed here for some time during his exile. The place where he stayed is calledSalim Mahal, The fort was finally annexed by Maharaja Pratap Singh in 1775 A.D. It is a forbidding structure with 15 large and 51 small towers and 446 openings formusketry, alongwith 8 huge towers encompassing it, The fort has several gates - Jai Pol, SurajPol, Laxman Pol, Chand Pol, Kishan Pol and Andheri Gate, Also there are remains of Jai Mahal, Nikumbh Mahal, SalimSagar, Suraj Kund and many temples. City Palace or Vinay Vitas Mahal : An 18th century palace harmoniouslyblending the Rajput and Mughal styles of architecture. While the ground floorshave been converted into government offices and district courts, the upper apartment ispresently a museum. Government Museum : The museum has the finest collection of Mughal and Rajputpaintings dating back to the 18th and 19th centuries and some rare ancientmanuscripts in Persian, Arabic, Urdu an Sanskrit. 'Gulistan' (the garden of roses)'Waqiat-i-Babri' (autobiography of the Mughal Emperor Babar) and 'Bostan' (the garden of spring)are some of the notable ones amongst the collection. It also has a copy of the great epic 'Mahabharatha' painted by the artistsof the Alwar school. A rich collection of the Indian armoury. are among other exhibits of the museum. Behind the City Palace is an artificial lake built in 1815 A.D. by Maharaja VinaySingh with few temples along its banks. A marvellous chhatri with unusual Bengali roof and arches, also known asthe Moosi Maharani ki Chhatri, is situated in this area. Pur Jan Vihar (Company Garden) : A picturesque garden, laid out during thereign of Maharaja Shiv Dan Singh in 1868 A.D. The garden has an enchanting setting called 'Shimla ' which was built byMaharaja Mangal Singh in 1885 A.D. The lush surroundings and the cool shades make it the idyllic visiting spot duringsummers. A splendid palace, built by Maharaja Jai Singh in 1918 A.D. A picturesque lake overlooking the palace makes it afascinating sight, A fabulous Sita Ram Temple in the palace attracts number of devotees, especiallyduring Ramnavami. One needs prior permission from the Secretary to visit the palace. An idyllic picnic spot with enchanting landscape of wooded hills and beautiful chhatris on the embankment of the10.5 sq. km placid lake. A magnificent royal palace and the hundtinglodge, built by Maharaja Vinay Singh in 1845 A.D.for his queen Shila stands overlooking thelake. Now converted as the Hotel Lake Palace, it offers boating and sailing facilities and is a delight for the trigger-happy photographers and film makers. A beautiful artificial lake constructed by Maharaja JaiSingh in 1910 A.D. is a popular spot for outings and picnics. During monsoons, sprawling greenery all around makes it avisual treat. Easily accessible by road from Alwar. The 765.80 sq. km. thickly wooded reserve cradled in thepicturesque valley of the Aravalis. Established in 1955, it is an excellent tigersanctuary under the Project Tiger. The dry decidous forests of the Reserve are notedfor their population of tiger, nilgai, sambhar, cheetal, four horned antelope and wild boar. A marvellous palace was built here by Maharaja Jai Singh in thehonour of the Duke of Edinburgh during his visit to the sanctuary. Presently, it hasbeen converted into a hotel - Sariska Palace. RTDC Hotel Tiger Den also offersexcellent accommodation at Sariska. � By Air : Delhi 163 km is the nearest airport. � By Rail : Good connection from prominent locations in and around the state.Some important train connections are : Shatabdi Express (New Delhi-Alwar-Ajmer); Superfast Express (New Delhi-Alwar-Ajmer); Intercity Express (Delhi Sarai Rohilla-Alwar-Jaipur);Marudhar Express (Varanasi-Alwar-Jodhpur); MandoreExpress (Delhi Sarai Rohilla-Alwar-Jodhpur). � By Road : Well connected with key destination in and not far offRajasthan and Delhi.